I won't be doing a blog entry next week but I should have time the next week. I went up to Granville on Monday for the photo shoot on Tuesday. It went very well but I forgot to take photos. The Fashion Framework article is on skirts. There were several designs for babies and children and we had three adorable models. It should be a fun issue. The proposals for the Knit and Crochet shows were due this week. As always I put things off until the last minute. I have proposed doing a two-day finishing class. Students could take both day or just one. I love teaching finishing and I haven't met a knitter who hasn't benefited from a finishing class. I am going to make some changes to the handout and add a few things. Pretty much everything required in Level 2 of the Masters Program will be covered. The students will have a complete finishing reference work if they take both days. (Of course, this is dependent on it being accepted!) I also proposed doing my Intarsia class and an increase/decrease class. If they are accepted, I am requiring that the students get a yarn kit from me. I am tired of students bringing in yarn that makes it very hard for them to focus on the techniques. Black mohair! This is the first week since I have been teaching the Basics class that I can remember not getting any new students. I did get a few lessons to review, all of which were excellent. I know I am preoccupied with my holiday knitting so I imagine everyone else is as well. My topic this week addresses something I saw on the TKGA forum in Ravelry as well as a few questions from my students. In the Masters Program and for the Basics Basics Basics class, students are to use worsted weight yarn and "appropriate sized" needles. We don't suggest a needle size. We leave it up the knitter to determine which size would be the best. When you work with a pattern, you have to use a needle size that will give you the suggested gauge but for the swatches you have to do this work on your own. This photo shows three swatches knit with the same yarn but using 3 different needle sizes. When you are determining what size needle to use, the main consideration is the fabric drape. For swatches in the Masters Program or Basics class, the fabric should not be so stiff that it can stand on its own. Nor should be so loose that the fabric is lacey. 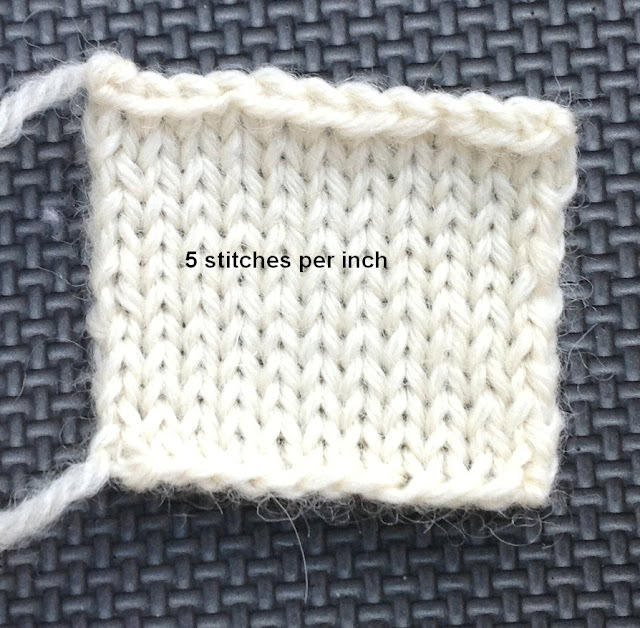 The place to start is with the needle size recommended on the yarn's label. I'm not sure how yarn companies determine this number. Do they base it on one knitter's sample or do they average several knitters' samples. The thing to remember is that chances are, it won't be what you get, most likely. If you are a new knitter and you think you want to continue knitting, invest in a set of interchangeable needles. Or, you can find another knitter who has a lot of needles. You should have a range of needles to determine the "appropriate" size. Knit small swatches to test the drape. Pick the one with the best drape and then do your gauge swatch. For worsted weight yarn, the Craft Yarn Council of America states that the recommended gauge (for stockinette) is 16-20 stitches for 4". This is what is expected for the swatches in the Masters Program. 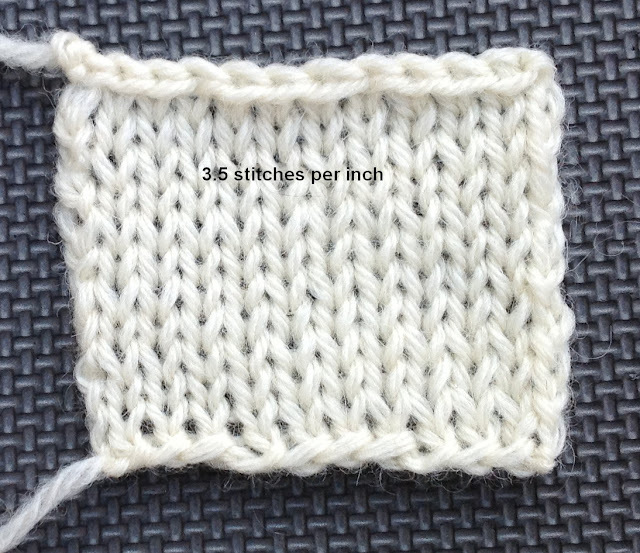 This swatch was knit using Size 4 needles and the gauge is 7 stitches per inch. This gauge does not work for swatches where you are demonstrating techniques. Perhaps if you are knitting a jacket or a pillow where you want a denser fabric, it would be "appropriate." Using smaller needles can disguise tension issues but this isn't a solution to a tension issue. If you plan to use published patterns you will have to use larger needles for worsted weight yarn. 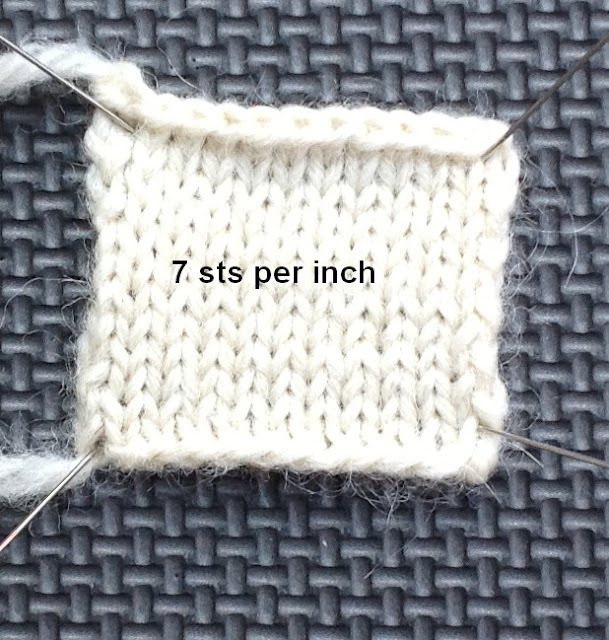 This photo shows a swatch knit with appropriate sized needles. The yarn label recommends Size 9 needles and a gauge of 4 stitches per inch. I prefer a slightly tighter gauge so I used Size 7 to get 5 stitches per inch. This is within the recommended range so I could use this size needle for swatches. For this swatch I used Size 10.5 needles. The gauge for 4" is 14.545 which rounds to 15 stitches. This is just a bit too large for the recommended gauge. I was surprised this swatch looks as good as it does. It is difficult to maintain even tension when you are using needles too large. I can't have the salon on Saturday as I will be spending the day at the district auditions for the Metropolitan Opera National Council. There will be 24 singers auditioning. It is a wonderful event (and free). It will last all day. I will be going to the Louisville airport on Sunday for the first of my Thanksgiving pick ups but I should be back by 3:30 for a short salon. 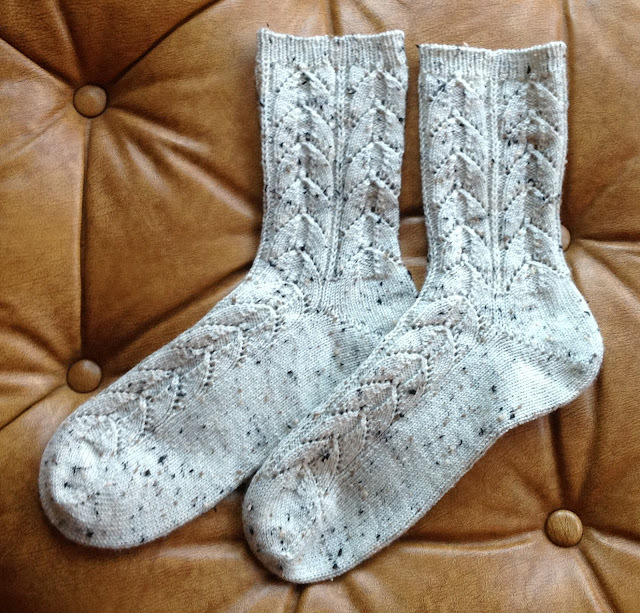 I spent a lot of this week in the car driving up to Ohio but I did finish Jan's socks. I also did another UK baby hat. (I made the mistake of showing one of the finished ones to a friend who just had her first grandson.) It looks just like the others so I didn't take a photo. Here are Jan's socks. I haven't knit a pair of Wasp Wings in a long time. I love this pattern. Jan likes neutral colors. This is yarn I got at the Manchester meeting from TuckerWood yarns. It was lovely to work with. I've started my first double knit project. Double knitting was not a requirement of the Masters Program when I did it. I used Suzanne Bryan's wonderful article in Cast On May-June 2012 to teach me the basics. I am happy to report that the article did the job. 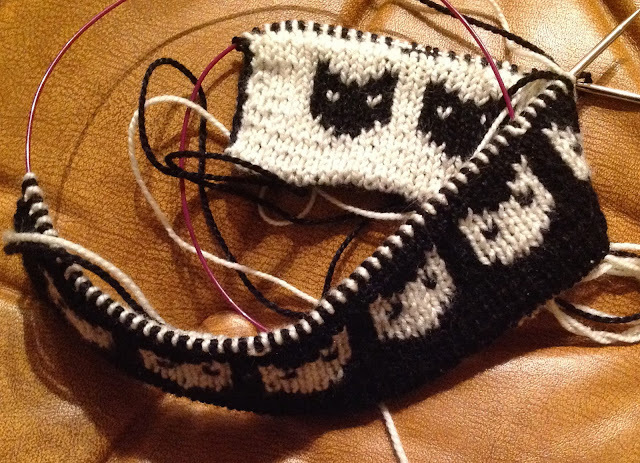 I am doing a reversible scarf in black and white with a cat head design for a friend of mine who lost her 18 year old black cat this year and now has a new white kitten. I am having so much fun. The photograph shows the scarf before I ripped it out. It was a little too wide and I wasn't happy with the tension. (I figured out how to correct that problem and I had told Suzanne I wouldn't let it bother me but I was wrong.) I'll take photos when I finish. I won't be surprised if I do a couple of other double knit projects. Labels: Choosing needle size. Drape.